DUH.....Wal-mart = Sweatshops. I wish more people would boycott these stores. If we are not VOTING with our DOLLARS the Corporations win. And in the future we all become the slaves of Corporations. I do the same Elizabeth, but find it difficult to convince others because everyone wants a bargain. I've recently watched a documentary about Wal-Mart, from its propaganda that was showing everything glowing: the job, the products, the company concern for their employees and clients. Everybody seamed so happy:" oh, I'm working for Wal-Mart, my life is good, I wasn't promoted, somebody else have, but nevermind..." Or a "commercial director" saying: " We are very much concerned about the safety of our clients". Meanwhile people were attacked in the Wal-Mart parkings, some ended up dead, the emplyees were practically used and abused, the little enterprises were closed, since they coudn't obtain any sponsorship and the big Wal-Mart was almost always sponsored with millions of dollars. Buying huge spaces, building the big markets, promising to the cities they will share the profit. After that, moving 1-2 miles away from the city, so not paying the profits anymore, since they woudn't belong to the city...Many huge empty buildings, that nobody wants...Employees that are working 16-18 hours a day, 7 days a week, on a miserable retribution...If somebody has to complain, he has to be ready to be punished or fired. Even their people which were checking the work conditions for the workers, if they saw something wrong and tell to the superiors, they would be shut down. The workers were trained to lie, to show themselves to be content. Somebody who used to work there said: "I'd stop one rich lady that is coming to buy a cheap toy and I'd tell her - You can buy this toy so cheap because I'm working day and night, 7 days a week, and my salary is almost nothing." Everybody should know these things about the big fat corporations. Even the fact the employees were encouraged to donate for the unfortunate ones - and while the poor exploited emplyees donated almost 120 million dollars, the "family" conducting the Wal-Mart corporation donated only 6000 dollars, when they - 4 people, have together 102 billion dollars...Somebody should tell me why they still are here and why their bussiness is still working. 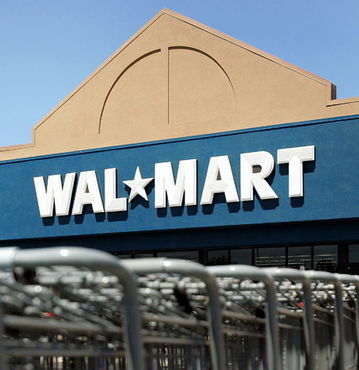 Walmart is still here because people will simply not stop shopping in them. We VOTE with our DOLLARS and too many people think it is OK to support this BIG BOX BUSINESS because they are "saving" dollars by shopping there. The SAD part of is that People are just plan Ignorant to the situation OR just don't CARE.